In this post, my results are below. I finished the race well above my target time of 3:00. My time was 3:17:22. I discuss my take away’s & race specifics below. The main purpose of this post is to share my best strategies for recovery after a long race. In my week 11 post, I discussed how to recover from a long run. The purpose of this recovery strategy was to optimize your training so you get the most out of your hard days (which are typically spaced 2-3 days apart). 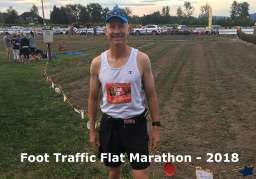 The following post marathon recovery strategy is similar in some respects, but keep in mind that we’ve just completed a 26 mile race & the 3-4 months of training. The race alone is an extreme test of endurance that takes much more out of our bodies than a typical workout. As a result, we need a comprehensive 3 week recovery program. Barring any injuries, the best strategy for full recovery starts in the first 30 minutes after the race and should last for the next 3 weeks, before you start training for your next event. There’s little to gain by rushing back into training within days of a marathon. Your risk of injury is high due the reduced resiliency of your muscles after running 26 miles. Within 30 minutes of finishing the race, you need to consume some calories right away. Typically there’s plenty of food available after the finish line. However, at smaller races, like the one I completed this week, there was very little food, so I brought my own. You can check beforehand with the race to understand what will have available. I prefer to eat easily digested high-carbohydrate foods such as bananas, bagels or even protein bars. Others like to drink their calories. Whatever you crave, go ahead and have it because the important thing is to get some calories into your body. You’re also dehydrated and your blood glucose is low, so you need to replace electrolytes. In addition to solid food consumption, I recommend water and sports drinks. After you leave the post-race celebration area, head home or to the hotel and get off your feet and then get cleaned up, stretch and get in some comfortable clothes and shoes. Consider wearing compression socks or tights. I really like my compression socks from Bauerfiend. I’ll wear them for at least 3 hours. You should consume a meal that consists of carbohydrates (fruits & vegetables), proteins and healthy fats. Choose nutritious foods like fruits, whole grains, vegetables and your favorite protein source like red meat, chicken or fish. Continue to hydrate and replace calories the rest of the day. In fact, drinking plenty of water throughout the week after your race is one of the best things you can do to ensure proper recovery. I strongly recommend consuming food that helps to reduce inflammation. There’s a list below. The morning after your race, you may have difficulty walking down stairs. This is common. Your quads may be stiff for 3-4 days after the race. Taking a break from running is actually helpful to your recovery. However, if you have access to a flat 2-3 mile route, try to walk or really easy jog (walking is preferred) for 20 – 30 minutes on the day after the marathon. The goal is to boost circulation and gently get the blood flow to your legs. This helps bring healing nutrients into your muscles and will also help to remove waste products and damaged tissue. Walking, light running and gentle massage can help. Important – If you have an injury or are experiencing any kind of pain (not general soreness) that prevents you from any prolonged walking/running, don’t walk or run. 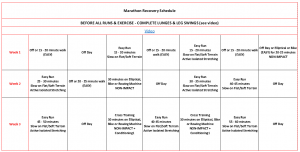 Completing this easy workout on day 1 is something that I have done the day after all of my marathons, because I believe it shortens my overall recovery time. I recommend taking the rest of the week off from running, with only some short (20-25 minutes) non-impact exercises on an elliptical or stationary bike. The other critical element of week 1 recovery is to drink a lot of water & continue with foods that reduce inflammation. Post marathon soreness typically disappears by the end of the week. However, damage within the muscle cells remain, so it’s important to continue with a full recovery plan. Regularly include the following foods in your diet. Increase these foods in the weeks following your race to speed recovery. Whole grains – regularly include oatmeal, brown rice, whole-wheat bread, and other unrefined grains into your diet. 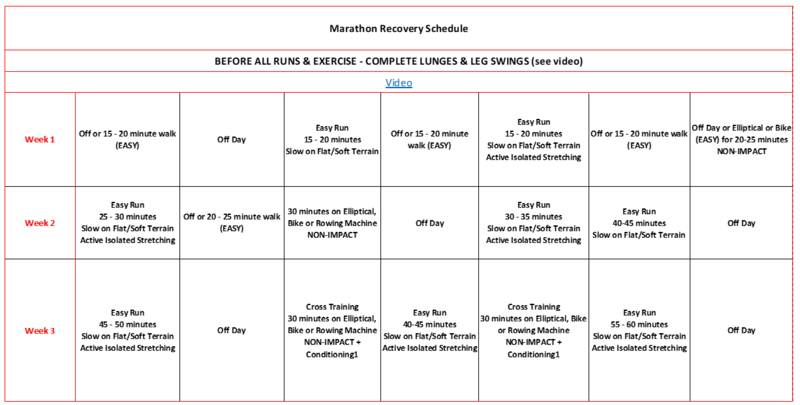 Following schedule outlines 3 weeks of post marathon recovery workouts. The first week is very “light.” Although I show some short runs starting in week 2, if your body is still sore, continue with the cross/low-impact training. Otherwise, keep your effort easy and the distance short (30-60 minutes). In week 3, the runs are a little longer and a little faster. You can also start some basic conditioning work in Week 3 if you’re not injured or feeling any residual/post race soreness. By week 4 you can move closer to your regular level of training. It’s essential that you don’t jump back into training for another race too soon. Typically, the soonest I race (any distance) after a marathon is 3 months. This is particularly important for less experienced and runners that are 40+ years old. 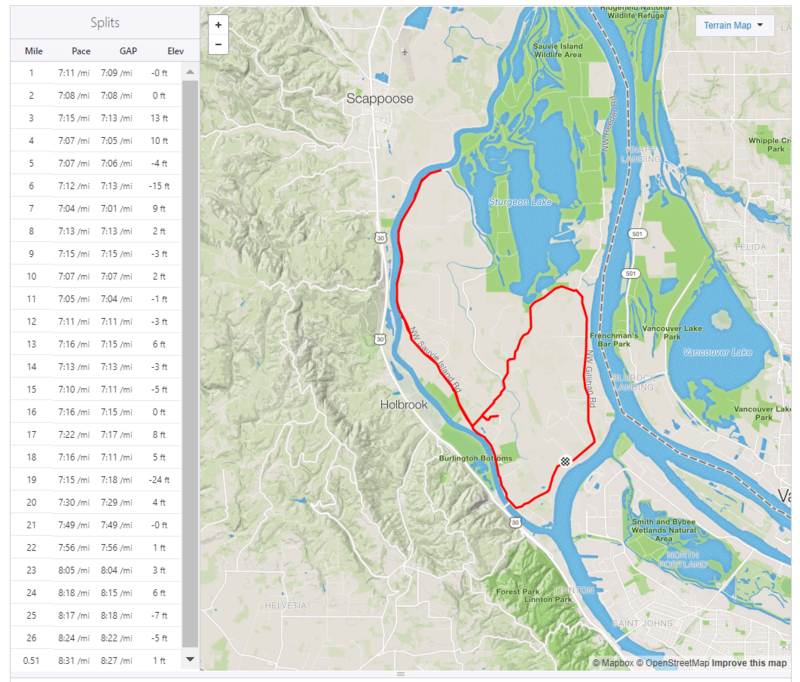 Here’s the link to my Strava Dashboard so you can see the details of each of the workouts that I completed this week & throughout my journey. Following are my workouts for the week of July 2nd. I didn’t come close to my goal of 3:00. Although I had been training to break 3, my last month’s workouts were leading me to believe that at time closer to 3:05 was more realistic. With this in mind, I decided to start conservatively at around 7:05 – 7:10/mile pace. 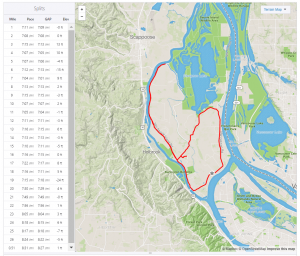 My thought was that if I could run 7:00 – 7:10 for the first 6+ miles, I could then settle into a low 7:00/mile pace and then pick it up if I felt good from mile 13+. As you can see with my splits, it didn’t work out that way. My primary challenge was that I was never able to sustain a sub 7:10/mile pace. Eventually, my feet started to really hurt (due to worn out orthotics that really had not bothered me too much) and I just ran out of gas the last 3-4 miles. 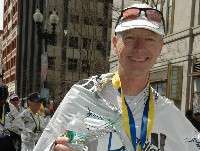 The good news is that the 3:17 is still 12+ minutes under my Boston Qualifying benchmark. I now that I’m blessed to be able to run and maintain a healthy lifestyle. I didn’t get sick or injured the entire time I trained for this marathon. It’s really “icing on the cake” when we can reach our time goals. Here’s my take away’s from the race and my training. I need new orthotics. Mine are worn. My feet were definitely feeling it the last 6-7 miles. I should have completed a few more longer runs (19-21 miles). I followed a plan that had worked for me earlier where I completed more longer tempos and longer repeats (1.5 – 2 miles). I was also training with a personal trainer at that time to get strong. My very best results over the years have come where I completed 2 x 19-21 mile runs. I should have completed more strength training. I used to go to a physical trainer who really helped me get strong. I did much of my conditioning on my own this time and I think at times I didn’t push myself hard enough. Being strong really helps towards the end of the race. Especially if you haven’t completed any 19-21 mile runs. Although my feet hurt, to be honest, my legs and hips were feeling it too. I always learn a lot from each marathon & the 3+ months of training. I will continue to share what I learn with each of those that read my blog and those whom I coach. Following image shows my race splits. My quads are tight today, however I can easily walk up/down stairs. To stretch my legs, get the blood flowing and simply speed recovery. No running today, but if I wanted, I feel I could. Also, I continue to drink plenty of water and eat healthy carbs, proteins & fats or a well balanced diet. Minimal stiffness in my quads, so I complete my first run after the race. The key is to jog slowly.